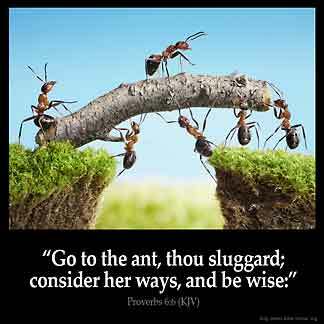 PROVERBS 6:6 KJV "Go to the ant, thou sluggard; consider her ways, and be wise:"
3Do this now, my son, and deliver thyself, when thou art come into the hand of thy friend; go, humble thyself, and make sure thy friend. 4Give not sleep to thine eyes, nor slumber to thine eyelids. 5Deliver thyself as a roe from the hand of the hunter, and as a bird from the hand of the fowler. 6Go to the ant, thou sluggard; consider her ways, and be wise: 7Which having no guide, overseer, or ruler, 8Provideth her meat in the summer, and gathereth her food in the harvest. 9How long wilt thou sleep, O sluggard? when wilt thou arise out of thy sleep? � Goe to the Ant, thou sluggard, consider her wayes, and be wise. 6:6 Go - This is a distinct precept; and it is for the most part as needless to seek, as hard to find, coherence in the proverbs. This Scripture is saying that one should be thrifty, conscientious, gather and save for those hard times in life when you find you 're in need. Its about being a good steward of HaShems bounty and blessings. The old saying is "waste not want not " . You don 't know what tomorrow holds in store for you. Be prepared for the evil days. God is coming soon but until then "occupy until He comes "
posted my comments.Ant is the smallest of all creation yet god is reminded of this creation work and appreciates its living, rather than the creation of man, who was formed in his own image.A slothful mans behaviour is shameful for gods eyes. I wish I could find a way to explain this Proverb to my teenage son who thinks he shouldn't help around the house.